The John Lewis Partnership has committed to making its transport fleet zero carbon by 2045 – a move that involves switching more than 3,200 trucks, trailers and vans to zero-emission vehicles. The retailer has set itself the target of reducing its operational greenhouse gas emissions to zero by 2050 without purchasing offsets. Transport emissions currently contribute over 40 per cent to the company’s overall carbon footprint and it will initially focus on reducing HGV emissions, which account for over two-thirds of its transport emissions. It is switching more than 500 of its heavy delivery trucks used for store deliveries to bio-methane powered versions. More than 60 bio-methane trucks have been purchased so far. It plans to move to electric vehicles as the UK’s infrastructure improves over the coming decades. It has already started electrifying its fleet of vans, and is working with technology company Arrival to trial four smart electric home delivery vans. 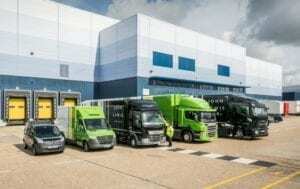 Six Waitrose delivery trucks are also currently trialling zero-emissions refrigeration units as part of the low emissions freight and logistics trial. JLP is reviewing its company car scheme to incentivise the uptake of electric cars. It currently has 75 electric vehicle charging points across the estate and from this year these will all offer a minimum of fast (7kW) charging.